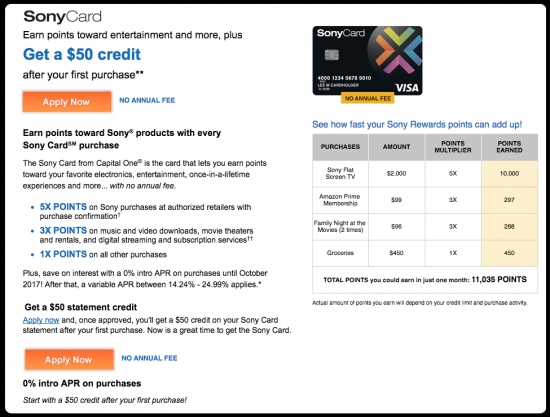 For people that spend a lot of money on home entertainment purchases, the SonyCard Visa Credit Card offers an opportunity to capitalize on extra points with no annual fee. Cardholders earn 5 points for every dollar spent on Sony purchases at authorized retailers, 3 points per dollar spent on other media (music/video downloads, movie theater tickets, movie rentals etc. ), and 1 point per dollar spent on all other purchases. 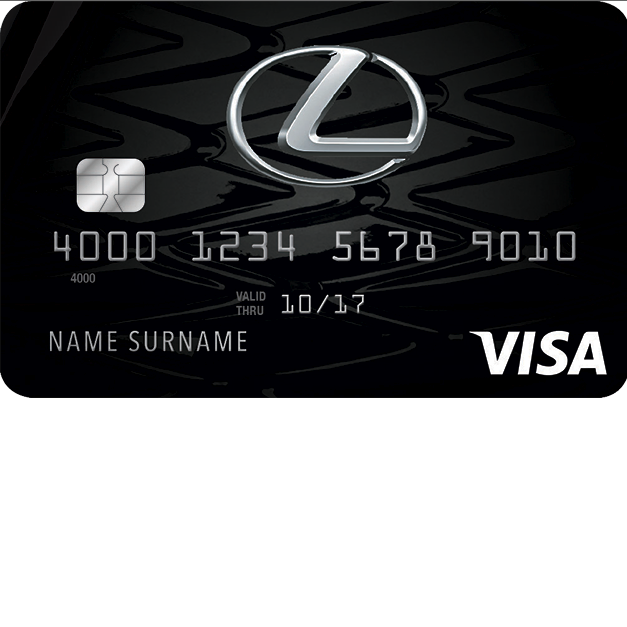 As you can see, there are plenty of opportunities to gain substantial rewards with this card. 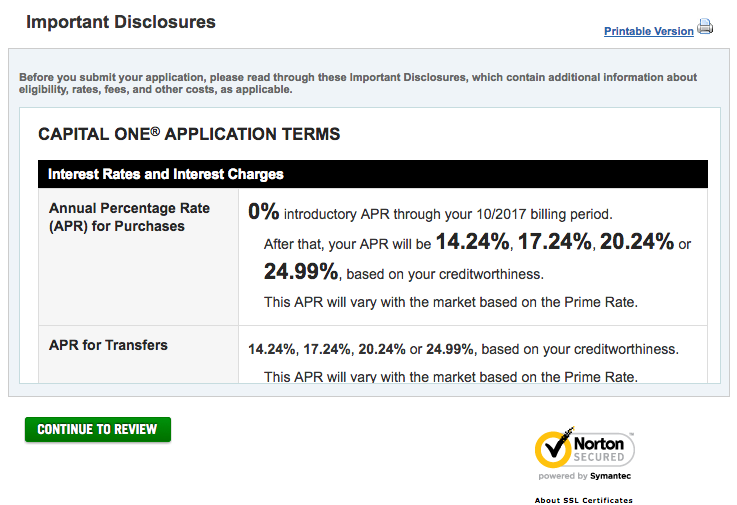 The APR for this card will be set at 14.24%, 17.24%, 20.24% or 24.99%, based on the applicant’s creditworthiness. This is great news if you have a good credit score, however, if there’s a strong chance that you will only be eligible for the 24.99% APR, you should think twice before applying. 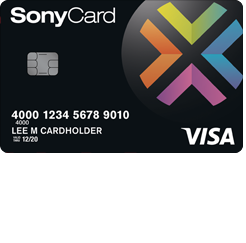 Signup bonuses for the SonyCard Visa Credit Card include a $50 credit after you make your first purchase (within 90 days of account opening), and a 0% introductory APR for the first 12 billing periods. 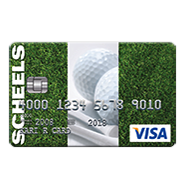 If you would like to apply for this card, scroll down and follow our step-by-step instructions on how to do so. Step 1 – To access your online application, start by going to the SonyCard summary page and clicking the orange Apply Now link. 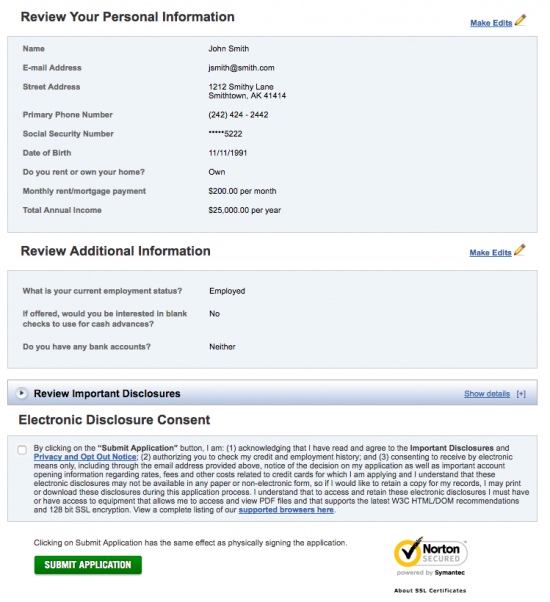 Step 3 – In the Additional Information window, first select your employment status from the first pull-down menu. Then, indicate whether you would like to receive blank cheques to be used for cash advances, and indicate which bank account(s) you have from the second pull-down menu. Step 4 – Now, review the terms and conditions for the SonyCard Visa Credit Card and click Continue to Review to proceed to the last step. Step 5 – In this final step, you will be able to review your application and make any necessary edits. 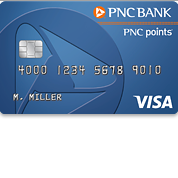 Following that, check the box indicating that you agree to the terms of this card, and then click Submit Application. Having successfully completed all the steps listed above, your application should now be submitted for review. 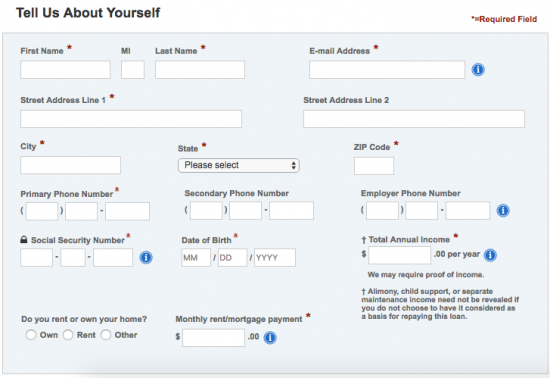 You should receive a confirmation message from Capital One soon. We hope that our tutorial has been helpful in guiding you through all the steps of the online application procedure for the SonyCard Visa Credit Card. Good luck with your application!